…Kindness. It’s a simple thing but has great power and everyone in the world can practice it daily. There’s a lot of ugliness in the world and people of all ages can be downright mean to each other, but there is also beauty and kindness that can bring a moment of light into anyone’s life. Before yelling at that driver that cut you off or getting exasperated with a child, try a moment of kindness instead and see what happens to you and those around you. I had the pleasure of interviewing Chameleon Cold-Brew CEO Chris Campbell. 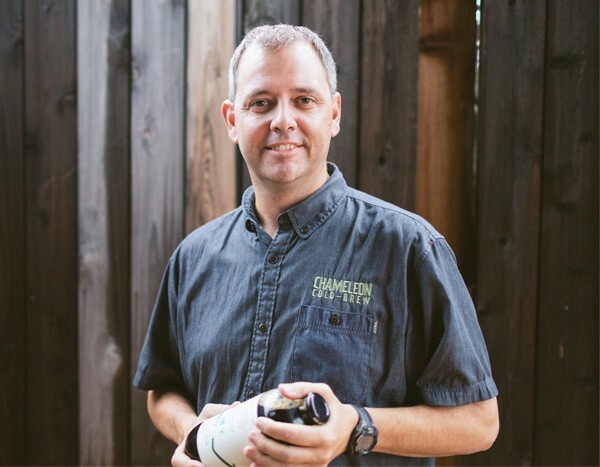 As co-founder and driving force behind the nation’s original purveyor of consciously crafted cold-brew coffee, Campbell has spearheaded Chameleon’s momentous growth from its humble beginnings in Austin, Texas in 2010, to the nationwide presence it has today. He credits Chameleon’s success to its roots in both quality and compassion. Thank you so much for joining us Chris. What is your “backstory”? After earning my MBA at Rice’s Jones Graduate School of Business, I pursued a career in consulting for close to a decade. Ultimately, I left the firm I was with to pursue an entrepreneurial path. I started by taking time off to travel around the world for two years, and met my original business partner, Steve Williams, who was making cold-brew at the coffee shop he owns in Austin. I was looking for a business to own or invest in and he had a cold-brew recipe, so we put our powers together and started making cold brew in a commercial kitchen and selling it to stores. Today, Chameleon Cold-Brew is the nation’s original purveyor of consciously crafted cold-brew coffee and the brand has seen triple-digit growth every year since the initial launch of the flagship Cold-Brew Black Coffee Concentrate. Can you share the funniest or most interesting story that happened to you since you started Chameleon? There are plenty of them and you should probably ask some of our employees from the early days to get their view. That said, getting our break at Whole Foods is a good one. We were at a food sampling event co-sponsored by Whole Foods and held at the Mexican American Cultural Heritage Center in Austin. We were there to sample the public and we knew that Whole Foods would have many people at the event. It was a very hot day and we had been sweating it out in the sun for eight or nine hours when a woman came by the booth for a sample. She enjoyed our coffee and starts asking questions that make it clear she’s not part of the general public and has some background in food and beverage. Eventually she said, “This seems like a great fit, why aren’t you at Whole Foods?” Well, I was worn out and a little hangry so I launched into a speech about how hard we had been trying to get in, but just couldn’t get anyone to pay attention. I’m sure I used a fair bit of colorful language and probably questioned their commitment to local companies. Eventually she told me to chill out and explained that she was the new store lead for their flagship store located in their global headquarters in Austin. She proceeded to get us set up with the right buyer and within a few weeks we had our first purchase order from them. It was a huge break and laid the groundwork for most of our growth in the first two years. We have always worked diligently to do the right thing for our people, our suppliers and our planet. We’ve stuck to these values relentlessly over the years and it has paid off. We have incredibly low employee turnover, suppliers who go above and beyond to make sure we get what we need when we need it at a price that’s fair to all parties and we sleep well at night knowing that we’ve made good choices for our little part of the world. For instance, we’ve remained committed to 100% organic coffees since the beginning. This can make it more difficult and expensive for us to get enough of the right quality beans for our products, but we’ve remained true to our commitments and gone even further by investing in multiple projects in our countries of origin that may not pay off for years to come. We do this because we know it is good for our suppliers, which will translate into success for our business so that we can continue to have the resources to give back. It is a virtuous circle and we’re proud of that. We recently unveiled our multifaceted sustainability platform, which exemplifies our core belief that quality must be rooted in compassion — for our partners and for our planet. We’ve already reached significant milestones with two of five community-driven projects in four countries, designed to empower farmers with the technical assistance and resources to not only improve the quality of organically produced coffee, but their livelihoods as well. 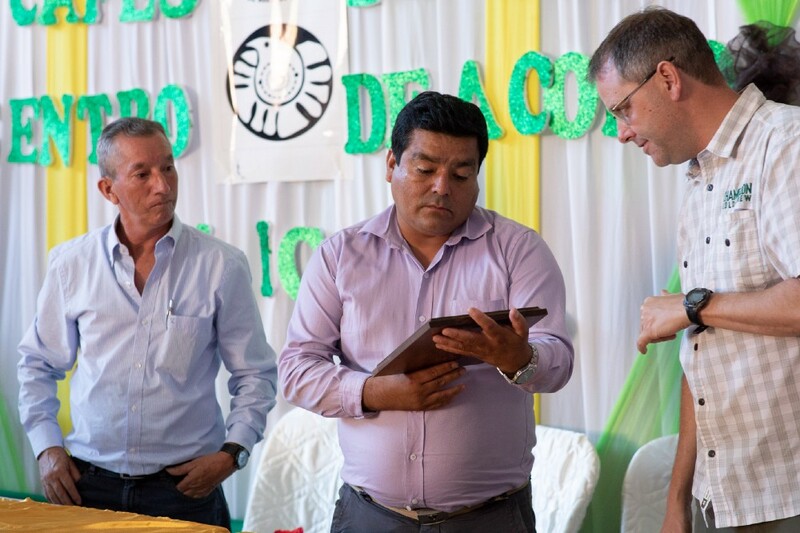 The completion of the Cenfrocafe Coffee Quality lab in San Ignacio, Peru features specialized equipment and a formally trained Q-Grader, who will be able to evaluate coffee quality and provide real-time feedback to farmers throughout the growing and harvesting season — improving the value proposition for the farming community and giving them real-time insights on how to improve their quality which should translate into a better price for the farmer. 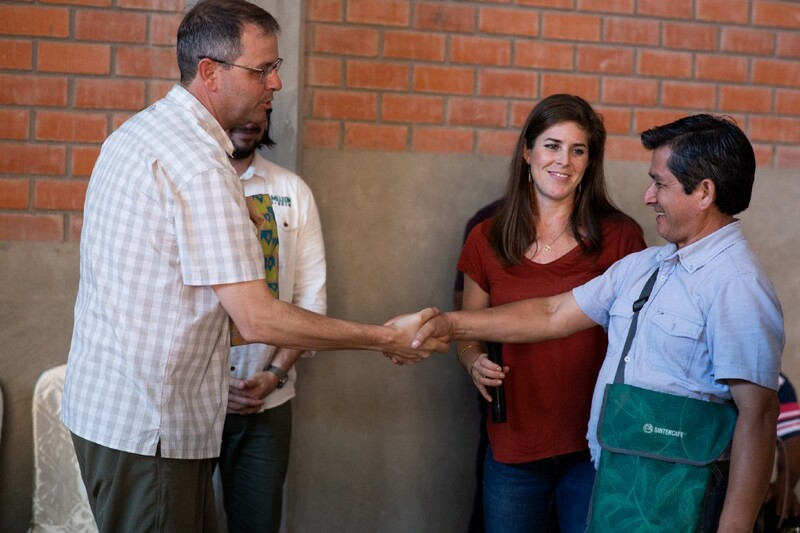 We will continue to engage with Cenfrocafe and the regional coffee-growing community via ongoing town hall meetings to collaboratively plan and develop the next phase of the project, with the goal of increasing overall coffee quality and yields. The second project, the Myanmar Organic Initiative, is also underway with the intention of supporting Myanmar’s efforts to certify organically grown coffee. While much of the coffee is produced using traditional organic methods, very little is certified and exported as organic. By creating a path to certification, we will expand the markets that these farmers can sell in to and also increase the price they can receive (and that we will pay). In an effort to support the project and raise the profile of coffee from the region, we are retailing a limited number of small-batch, micro-lot coffee from Myaing, Myanmar — aged eight weeks in FEW Whiskey barrels — with 100 percent of gross proceeds benefiting Myanmar communities for organic-focused projects. This is a very special and unique coffee that will make a big splash. Invest in your people and do not stop doing it, even if it is difficult to sustain. As you make these investments, be sure that they are relevant to each person and support the type of culture you’re trying to promote. For us, healthcare has been a key benefit. We cover 100% of each employee’s health insurance premiums and have a very robust plan that will cover their needs in almost any medical situation. The second piece of advice would be to let go and trust your team to do the right thing and make the right choices. As CEO, a big part of the job is to ensure everyone has the resources they need to do their job. After that, you need to get out of the way and let them do it. Be there to offer support and guidance or jump if things go haywire but otherwise, hire the right folks and then watch them flourish. There are many. We’ve been blessed with our fair share of good luck and friendship along the way. However, the one that is most important to the foundations of our success is my wife. I know it’s cliché but it’s true. For the first two or three years, I didn’t pull a pay check and she was 100% responsible for supporting our family financially. On top of that, she let me run through most of our savings in getting the company started before we raised investor capital in 2012. This was critical because it kept me in a position of majority control and ultimately set the stage for later years when we were able to operate with limited additional investment, preserving equity for all of the shareholders (including employees). In addition to our commitments and investments in organic farming and our producers, we’ve been able to support our own team of about 45 people, many of whom have families, and many more folks who work for our suppliers and vendors. This means people are able to provide a good life for their families and I have a lot of pride in that. At the end of the day, we’re good people and we’ve proven that sometimes the “good guys” do win. I like telling folks that and explaining that being true to your positive values is not always easy and it is rarely cheap, but it does pays off. 1. Take care of yourself — I went head first into building the company and for years never took time off, stopped exercising and just worked all the time. As a result, I eventually wore myself out and though I powered through it, I couldn’t do it again. If I’d taken better care of myself, I believe I would have been a better CEO. Now, I’m not shy about being sure I’m exercising and eating (relatively) well while also spending more time with my family. Honestly, that’s about it — I’ve had plenty of good advice along the way. Kindness. It’s a simple thing but has great power and everyone in the world can practice it daily. There’s a lot of ugliness in the world and people of all ages can be downright mean to each other, but there is also beauty and kindness that can bring a moment of light into anyone’s life. Before yelling at that driver that cut you off or getting exasperated with a child, try a moment of kindness instead and see what happens to you and those around you. “Congratulations, you’re the biggest fish in the smallest pond.” In other words, stay humble and be aware that there’s always another level to rise to. Is there a person in the world, or in the US with whom you would love to have a private breakfast or lunch with, and why? I would love to share a meal with Theodore Roosevelt. I’m an admirer of his progressive policy, especially his work and foresight in conversation.